Drying Ink: Review | A Little Pratchett! Review | A Little Pratchett! Oh dear, that was a lot more than three weeks - but I'm back at last, and apologies for taking so long about it! 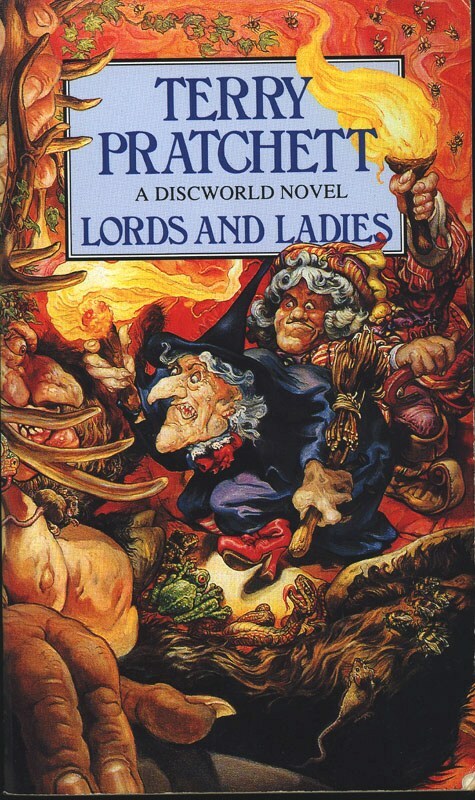 So let's get started with a new review in one of my favourite series: Discworld. I've always had a soft spot for Granny Weatherwax as a character, and it's clear that Pratchett writes her ever better over the course of the 'Witches' subseries. And since Lords and Ladies is several books into said series, Weatherwax is pretty fleshed out indeed - hard-headed, prideful, but with a reason for it (she believes she's the best because, well, she is). Lords and Ladies takes place just as the three witches return to Lancre following the events of Witches Abroad - only to find that there are (guess what?) problems. It looks like the elves might be coming back. And this is typically Pratchett: taking a common fantasy concept, even cliche, and deconstructing it. Or at least giving it a hard yank. Pratchett's elves use glamour, are capricious, and everyone remembers them as 'nice' because... Well. See the 'glamour' part. Not to mention Magrat. Okay, I mentioned Magrat, so let's discuss her. For a while, her character was rather passive, but in Lords and Ladies she becomes far more of a protagonist. At first trying to discover what exactly a queen does (entertainingly), then fighting the elvish incursion in the armour of a queen who... Well. You'll find out, but it's silly and amazing simultaneously, like a great deal of Pratchett. Magrat is a great deal more likeable in Lords and Ladies, and I'm hoping that continues into my reread of Carpe Jugulum. Fingers crossed! But as always, it's Ogg and Weatherwax who run the show - their characters perfectly complement each other, perfectly hilariously. Weatherwax's confrontation with the elves is one of my favourite Discworld moments. They're polar opposites: the Queen is small minded and appearance-obsessed, while Weatherwax... can be small minded too, but otherwise is quite the opposite. Pratchett plays these characters, from Ridcully to Casanunda, off perfectly, and it's a pleasure to read. It's not the funniest Discworld novel, that accolade has to go to Going Postal for me, but it is certainly the best in the witches subseries so far on my reread. But there's two left to go, so perhaps that's empty praise. But this isn't: it's a truly enjoyable book, and definitely worth your time, particularly if you're familiar with the witches and the Lancre characters. However, it's not an ideal starting point to either the subseries or Discworld as a whole. If you're unfamiliar with the witches, Wyrd Sisters may be a better starting point. I do miss Greebo, though. Finally! Good to have you back and great review. I need to read more Pratchett that's for sure. I've only read the first two Discworld books. Haha, thanks. :D Glad to be back at last, and plenty more reviews planned. And yeah, Discworld is definitely worth it - I actually find the first two far more 'first novel'-ish than the others, and they're not very reflective of his later style (sill fun though). Going Postal is by far my favourite - I mean, 'conman forced to run the postal service' is magnificently odd as a premise. Thanks for sharing,plz keep going and I am looking forward to your next post.